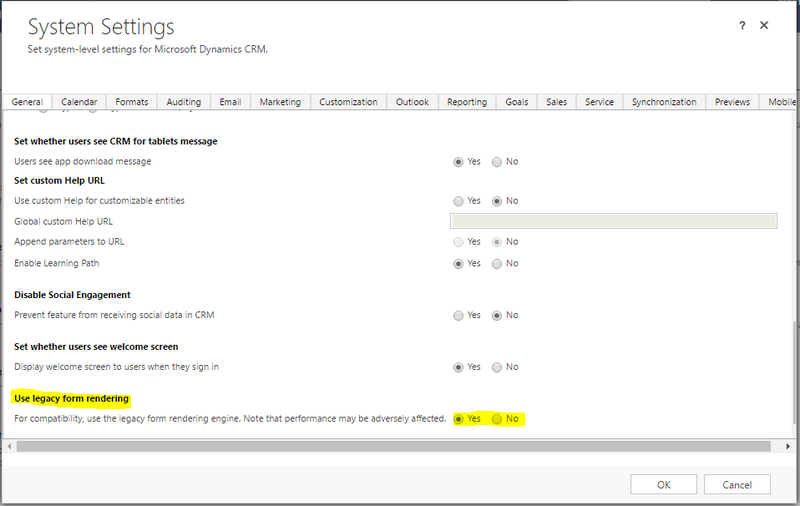 For faster and efficient form loading CRM Online 2015 Update 1 (v7.1) introduced a new form rendering engine. New engine renders forms up to 8 times faster than legacy form. Creating a new HTML content in the parent window for persistent content (and assumed that the parent window was the main CRM iframe. Accessing window.parent() from a web resource that may assume for example there’s a variable set in the current window context. Form rendering engine effects whole CRM instance it is not per entity or form. Legacy form rendering is still supported and rendering engine can be switched but CRM team’s plan is to remove it in future.